This Catechism offers an excellent avenue to teach the Bible. 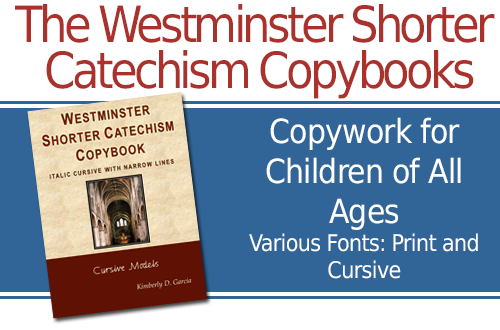 Using the Westminster Shorter Catechism for copywork provides a gentle yet effective way to introduce this information to children of all ages. It takes very little time but has enormous benefits. Frequently, younger children are assigned copywork to teach: grammar, vocabulary, and writing. Copywork is assigned to young children because it works. Children learn what they read and they learn what they write. Great writers from history learned via copywork–Benjamin Franklin and Frederick Douglas. Yet as student get older, we often quit assigning them copywork. One of the downfalls of not providing copywork to older children is that they develop poor penmanship as they focus on upper level studies. Older children, without the proper reinforcement of handwriting practice, often develop poor penmanship as they work through rigorous and more involved schedules. One way they save time is by writing as quickly as possible. To maintain proper handwriting technique, older students often need penmanship practice. The Westminster Shorter Catechism Copybook provides an excellent means of handwriting practice for both younger and older students. View the Westminster Shorter Catechism Copybooks Now!